Several days ago, we received some pictures from our engineers in Uzbekistan, which is about our BLL-20 waste pyrolysis plant. We have exported the continuous pyrolysis plant to Uzbekistan two months ago, and now, the plant is successfully installed in Uzbekistan. The waste pyrolysis equipment is used as the following equipment of waste sorting plant, to further process the plastic waste sorted from the sorting plant. 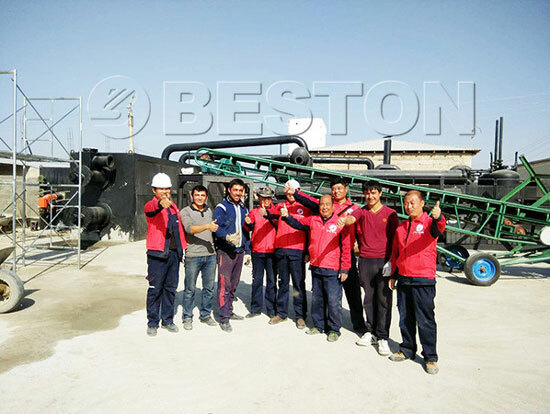 The related products included in Beston waste recycling line have been shipped to Uzbekistan and being installed now. The entire solid waste processing plant includes waste sorting plant, waste pyrolysis plant, charcoal making machine, oil distillation plant, carbon black processing plant, waste plastic recycling machine, etc. Our engineers will stay in Uzbekistan until all of the devices are installed and put into production smoothly. We will keep updating and please pay attention. 3. Periodical call visit, to make sure there are no problems with the equipment. 4. Design a specific maintenance program according to different situation of your plant.